TCi director Prabhu Pingali set out on a 4,000 km journey across four states - Maharashtra, Andhra Pradesh, Odisha and Jharkhand - to conduct interviews with farmers in more than 20 locations throughout India. Here are some of his reflections at the completion of the trip. One common feature I noticed across most of the locations I visited was the emergence and growing strength of women’s groups. Initially set up for facilitating micro-finance, these groups very quickly became the focal points of overall change in rural communities. I spoke to groups that were involved in agricultural innovation, micro-finance, nutrition improvement, and access to drinking water. What impressed me most was how these groups very quickly became a conduit for overall empowerment of rural women in India. The groups gave women the strength to create change that they would not have been able to achieve individually. We sat through a group discussion in a village in Odisha where women were talking about precautions to be taken during pregnancy, such as not lifting and carrying water from the village well, a routine task for any rural housewife. A behavior change in this regard involves not just the woman concerned but also her husband, mother-in-law and other adults in the household. We listened as the young women in the group discussed the resistance at home when they tried to avoid heavy lifting tasks. Some of the more enlightened mother-in-laws present offered to help get the message across to their peers. The group also enlisted men to carry the message to other men and to persuade them to step in and take on the water delivery task during the time when their wives are pregnant. The strength of the group allows a simple message to cause social change. Several NGOs and government groups have discovered that the women’s groups are an effective platform for getting their work done. PRADAN, a pioneer in setting up women’s self-help groups, has been working with them in all of its projects. In Jharkhand, we visited a village where PRADAN was helping the community change its land use on the upper watershed in order to improve the supply of water to its drinking water wells. 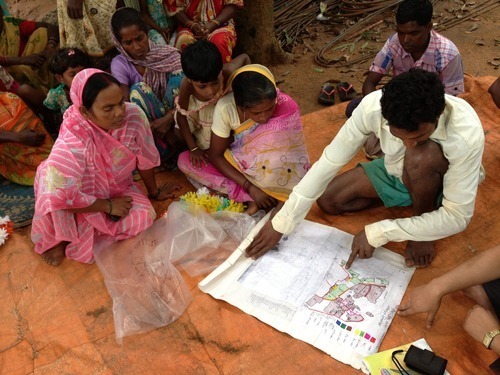 The women in the community participated in mapping the watershed, in making decisions on cropping pattern changes, and in implementing the change. As a result, perennials have replaced annual crops in the upper watershed, soil erosion has reduced significantly, and well water is available throughout the year, even during the peak summer months. In my travels through rural India, I have been seeing signs of positive change and a definite sense of optimism about the future. It is change from within the community, and is being driven by empowered women.